Oops - we don't appear to have a video for the ScanSnap S500M (Mac). ScanSnap S500M defines the Fujitsu way that an efficient document scanner for the office professional's personal every-day use should took like. Now for the first time simple high quality scanning of typical office documents is becoming available within the Macintosh environment, without the burden of additional work. ScanSnap S500M uses a specially developed method of driving the scanning device. Actually, the "normal" scanning process is totally reversed. 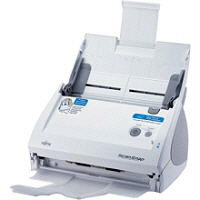 Using ScanSnap S500M you just insert a stack of paper and press a button to initiate the scan process. This will automatically create and store a PDF file and hand it over to Adobe Acrobat. Utilizing the OCR functionality of the full version of Acrobat that is included within the ScanSnap S500M package, this scanned document can even be converted to a fully searchable PDF file. Since all this is achieved within seconds to a visibly high quality standard, any user will utilise this scanner every single day when office documents need to be transformed into an electronic format. Instantly, even piles of document on top of office desks begin to vanish.